Oh no! Call 007! Quick! The bad guy wants to steal… nuclear weapons? A doomsday device? No… just water. He wants to steal water. Oh, but has no problem with hiding out in a hotel that is completely flammable. Or inflammable. Or both. Or whatever. He’s lame, that’s my point. As drippy as the substance he wants to pilfer. Carver tries to control the world by controlling the world’s news. Ha! Twitter would have eaten him alive. Licence to get chopped up in a big grinder, more like. Seriously, he did well to make it as low as number 37. Poor Pike. Like her namesake in Dad’s Army, she’s reduced to meaningless tasks here, like sword-fighting Halle Berry in a tube top. If ever a Bond villain was full of hot air, it’s this one. What a creepy duo… when you’re ten years old. Now they’re just annoying, exactly like the film in which they feature. Graves is actually North Korean Colonel Moon in disguise. If this is how what North Korean military types want to look like through western eyes, heaven help all of us. Perhaps not an awful villain, just a criminally nondescript one. Mind you, it’s hard to deflect any of the attention away from Roger Moore’s gilet. Another one who seems cool when you’re a kid, but Scaramanga wants to be just like Bond and tries to steal some solar powered gizmo. Not exactly the Brain from Pinky and the Brain then, is he? Mikkelsen is more famous now as playing a really great villain in the hungry shape of Hannibal Lecter, but his Le Chiffre is a bit of a weed, although to be fair the aim of Casino Royale was to reboot Bond, not the guy who loses money at cards and gets taken out like a wuss. Yeah, he’s got a bullet in his brain that means he can’t feel pain or something, but apart from that, Renard’s chief weapon is his dullness. They should have thrown another Carlyle character into the action… Bond v Begbie, now that have upped the box office takings. This is the movie in which Roger Moore dresses up as a clown to defuse a bomb, so any villain would have their work cut out to grab the headlines. Berkoff, as was his wont, decides to fight clown with ham, and almost pulls it off. Almost. There is a fine tradition of Bond baddies turning into goodies towards the end of the film, and it’s usually extremely well signposted, but in the case of May Day it’s actually quite a poignant moment, as she lays down her life for Bond. Not the first or last woman to do that, but one of the most memorable. Probably the best scene in Tomorrow Never Dies features the meticulous Dr Kaufman, whose only weakness is his arrogance. Not the first Boris to think he is invincible, but unlike the mayor of London, this one is actually quite funny. Great death scene too. Most Bond villains have a slightly comedic element to them, but the refreshing thing about Sanchez is that he’s simply a vindictive, vicious git, meaning only an off-the-reservation Bond can be ruthless enough to take him down. ‘Mommy was very bad.’ It never struck me that M might stand for Mom until Silva came along in Skyfall. His introduction, teasing out 007’s gay side, is fantastic, so it’s a bit of a shame that his subsequent masterplan is a rehash of the one in The World Is Not Enough and the Joker’s in The Dark Knight. And he falls for the Home Alone ending. These two Disney fans give Bond, albeit the oldest looking Bond ever, a good kicking, until they make the mistake of jumping into a pool after him. Deer and rabbit obviously can’t swim. I’m not saying The World Is Not Enough is a masterpiece – it has Denise Richards in it, for goodness sake – but it’s definitely not as bad as some suggest, and is easily the second best of Pierce Brosnan’s four Bonds. A lot of this is down to the main villain – no, not that dullard with the bullet in his head – but Elektra King, who ruthlessly kills her father in a bid to control the world’s oil. Never play frisbee with this guy, never. Shaw might have made a good Bond himself, but he makes a great Bond villain, until 007 disposes of him on a train. First class entertainment. Bit of a sneaky one this, but then he’s a bit of sneaky villain. Mr White is the Quantum bad boy who takes out Le Chiffre (saving a ball-aching Bond in the process) and escapes the clutches of MI6. Technically, he’s still out there, scheming away. Okay, so he went and fell in love in Moonraker and turned into a goodie – and that was totally rubbish – but let’s not forget the good bad work Jaws did in The Spy Who Loved Me. What is it with henchmen attacking Bond on trains? Good on old Emilio. He had a decent plan (seizing nuclear weapons; the usual drill, but proven industry), an eye-patch and wasn’t afraid to get into a scrap with 007. He would have had the drop on Bond too, if his mistress hadn’t harpooned him in the back. Worth his place in the top ten for plotting to blow up Silicon Valley, Zorin is the Bond villain as a rock star, and his hair was the inspiration for Javier Bardem’s performance in Skyfall. While Donald Pleasance is probably the quintessential Blofeld, I do have a soft spot for Telly Savalas in OHMSS, a Blofeld who isn’t afraid to get his hands dirty. The reason he isn’t lower in this list is that, most of the time, he just sits around stroking a cat. If I want my main villain to do that, I can watch Inspector Gadget. 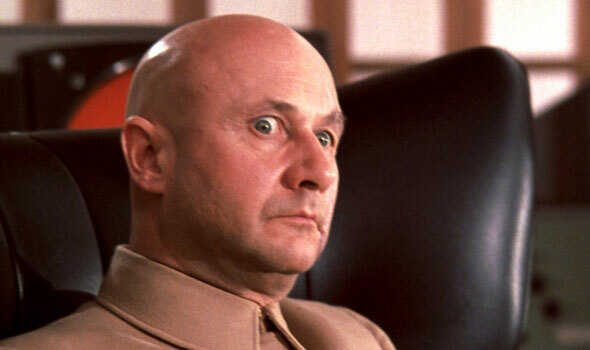 If Christoph Waltz is to be Blofeld, he has some big bald heads to fill. When people say the love the movie Goldfinger, what they really mean is they love the admittedly great last ten minutes in Fort Knox. The plot before that? Bond gets kidnapped and hangs around with the eponymous villain, even plays golf with him… and bar a bit of laser surgery, that’s about it. Goldfinger, named after architect Erno Goldfinger (you can still go visit his house in Hampstead), has a plan to… take over the world – oh no, sorry, he just wants to be rich. Meh. Come on Auric, think bigger! Now here’s a guy with a master plan: convince the US and the USSR to open nuclear warfare on one another, then restart civilisation under the sea. In your face, Auric. The original and one of the best, the benchmark on which all other Bond villains are judged. In Ian Fleming’s book, Dr No has his heart on his right side and his hands cut off by Chinese ganglords. In the movie, he lost them to radiation, but it doesn’t lessen his badassery, although the metal replacements ultimately lead to his doom. Great name, great henchwoman. Great way of killing blokes too, trapping them between her thunder thighs. Surprised Christian Louboutin has never tried a Rosa Klebb knife-shoe tie-in: would be very popular among secret agents. Even a terrible, terrible Bond film (and there have been a lot) like Moonraker can shine if it has the right villain. To start with, he has a super name. And he has a super plan: kill everyone on Earth and then repopulate the planet with a special space race of super-humans. Genius. Crap film, mind. Her first words to Bond are ‘I’m the money’, and like cash, he comes to treasure her, until she breaks his heart. That’s why she’s such a great Bond villain: she doesn’t hurt 007 with a bullet or a laser but with a different kind of torture, and her betrayal turns him into the cold-hearted git he becomes. The greatest Bond film ever has the greatest Bond bad guy of them all, because he’s actually… 006! This entry was posted on December 5, 2014 at 10:10 am and is filed under TOP FIVES with tags James Bond. You can follow any responses to this entry through the RSS 2.0 feed. You can leave a response, or trackback from your own site. Totally agree with this list, great effort. GoldenEye is a childhood favourite of mine and of course you can’t go wrong with Sean Bean. I just saw Big Eyes and was soooo turned off by Christoph Waltz. I’m afraid of what he’ll do to Spectre. I disagree slightly with the order, but can’t complain about Sean Bean in the number 1 spot.